Cecile Eledge gave up coffee for nine months. She did everything her doctors told her. 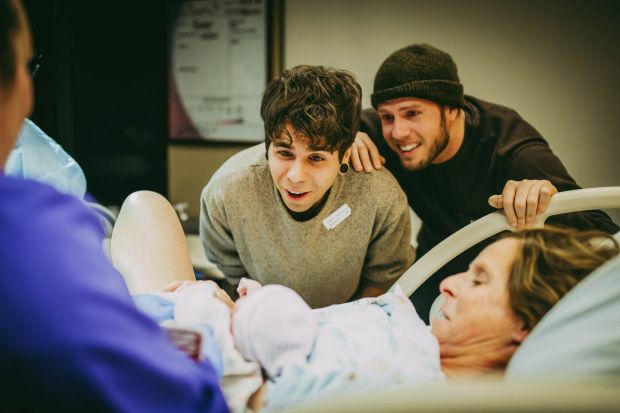 Eledge, 61, said she was joking when she offered to be the gestational surrogate her son and his husband needed. To her surprise, she passed a battery of tests including heart, cholesterol and stress. 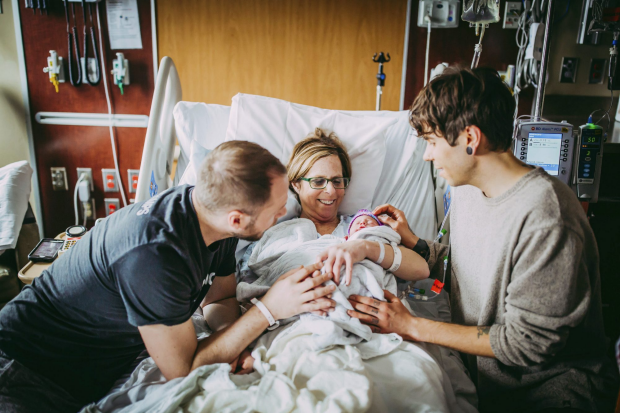 On March 25, Uma Louise was born at Nebraska Medical Centre weighing 5 pounds, 13 ounces (2.6kg). 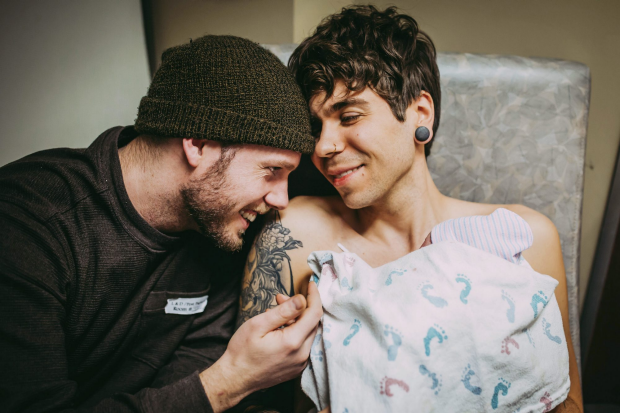 Married dads Matthew Eledge and Elliot Dougherty said the birth of their daughter was possible thanks to the women in their life, Eledge's mother and Dougherty's sister. ​Eledge's mother carried and delivered their baby. Dougherty's sister donated eggs to conceive. "We have some selfless women in our lives," Matthew Eledge, 32, a teacher, said. His mother said through all the testing, she kept expecting doctors to say she wasn't fit to be a surrogate. "But the doctors said there is absolutely no reason you can't go full term," she said. "'Everything is in our favour,' they said." "I would have felt terrible if anything had happened," she said. "I followed things to the letter. You know, I love my coffee." Baby Uma was conceived through in vitro fertilisation, using Eledge's sperm and eggs from Dougherty's sister, Lea Yribe. Dougherty's sister made the couple, who "felt vulnerable", think having a child was even possible. Dougherty started talking to his sister about it a couple a years ago, and his now 26-year-old sibling offered to donate some of her eggs. "That whole thing gave us the momentum to start a family," said Dougherty, 29, a hair stylist. She was very committed from the get-go." Matthew Eledge said with their salaries as a school teacher and hair stylist, it would have been so much more difficult to have a child and pay someone to serve as surrogate and egg donor. But it also seemed cold and corporate. "We also believe it takes a village to raise a family," he said. 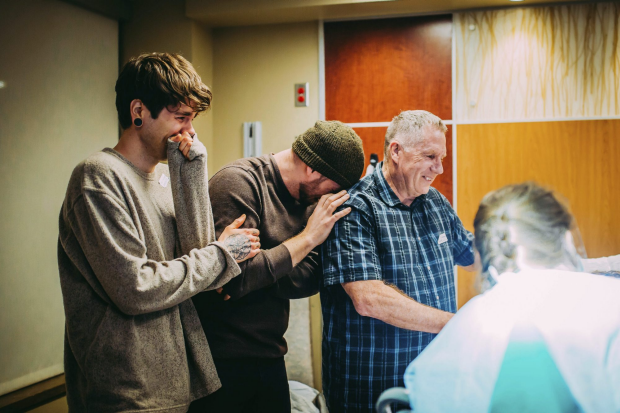 "While we may have taken an unconventional approach, we were able to talk about the process and it made everything more exciting and more fun." Elliot Dougherty added: "I can't believe tomorrow will be a week. She's going to be a week old! The whole thing has just been amazing."